Welcome to this week's Melbourne events, exhibitions, sports and community guide for Tuesday January 26 to Monday February 1, 2010. This week.. The BBQ gets a good scraping and a rub down with a lemon (I know a certain venue where that'll cost you a pretty penny, but that's neither here nor there) as Melbourne celebrates Australia Day with a range of events about town that include the free Share The Spirit Festival at Treasury Gardens. There's also the return of the St Jerome Laneway Festival, held at its new location of Footscray Arts Centre. While it may not be the tucked away little gem that it was, and while the St Jerome Footscray Arts Centre Festival may not have the same ring - hence the lack of name change- the festival remains one of the bright sparks that celebrates independent arts, music and everything else that's 'nifty', as the kids no longer say. Check out our School Holiday Guide for all the latest on what to do with the kids during the Summer School Holidays ending Sunday January 31. The holiday guide offers some of the best things to do over the holiday period for the young and young at heart, with events, tours and holiday care programs.. all in marvellous Melbourne! Australia Day is celebrated with a wide range of special events held to honour the day with plenty of free events and activities that you'll find in Melbourne and throughout the suburbs with many local councils offering events such as BBQ days, Ceremonies and more. Share the Spirit, held at East Melbourne's Treasury Gardens, is a free festival that marks Australia Day and also recognises the original occupants of this country. With a great line-up of performers, the event includes community market stalls, workshops and children's activities. Caulfield Racecourse will be holding an Australia Day Meeting where you can enjoy all the action on the track and celebrate Australia Day by relaxing in the Summer Turf Bar. Kids can be entertained with the free children's activities so there's something for everyone at Caulfield. The Australia Day Beerfest, held at the iconic bar of Young & Jackson, celebrates our national day with a great day of live entertainment from performers that include The Surfdogs. With Beer Giveaways on offer all day, entry to the event includes the chance to win two brewing kits! The St Jerome's Laneway Festival, held this year at the new venue of Footscray Community Arts Centre, is the popular street party that celebrates creativity with a day of art installations, gourmet and exotic food, fashion markets and live music, with performers including the Dirty Three. Audi Victoria Week, Australia's largest sailing event which was first held in 1844, has become a standout celebration in Geelong that features entertainment for the entire family. With shoreside activities for all ages, it includes craft markets, street theatre and musical acts across two stages. The Midsumma Festival celebrates Melbourne's premier Gay and Lesbian culture at various venues with queer centric and queer friendly performances and entertainment including special performances, cabaret, art exhibitions, community events and much more in its extensive program. The Herring Island Summer Arts Festival offers special exhibitions every Saturday and Sunday at the Herring Island Environmental Sculpture Park in Toorak. Accessible by boat with a punt service, the arts festival includes special artists demonstrations, talks and activities. The Port Fairy Moyneyana Festival, Victoria's longest running festival, is a community event that offers fun for the whole family with daily entertainment that includes historic tours, concerts and film screenings, camel rides, workshops and much more with many attractions free. To find out about future events in Melbourne, have a look at our new calendar, with details about many more events that lie ahead so you can jot them down on the to-do list , including Exhibitions, Live Gigs, Theatre, Markets, Expos and more.. Heroes and Villains, a special presentation of artwork and prints held at Silver K Gallery in Armadale, is an extensive collection of artwork featured in comics and animation. Showcasing many rare pieces released from Warner Bros, it includes works by the talented artist, Alex Ross. TransMasculinities, showing at red gallery in Fitzroy North, is an exhibition held as part of Midsumma Festival, featuring photography, painting, drawing and video by nine artists from around Australia, the United Kingdom and the United States whose works examine female-to-male transitioning. Glory Box is a Modern Art Exhibition that presents a symbolic look at love, culture and desire, generating bold, humorous and sometimes provocative imagery. Works featured are on display at The Workshop Bar in Elizabeth Street, a 'typically' Melbourne, inner city venue. Blueprint for a Better World, presented by Caritas Australia and AusAID, is an interactive multimedia exhibition that highlights the realities of extreme poverty while explaining how we can achieve Millennium Development Goals. It's held at Fed Square's BMW Edge Theatre. 'til you drop, held at the State Library of Victoria, is a free exhibition that celebrates Melbourne's passion for shopping, from the Paris end of Collins Street to the local corner store. The exhibition features historic photographs and nostalgic items on display such as wartime ration cards and more. Anatomy to Robots, showing at Southbank's Queensbridge Square, is a remarkable exhibition that brings the designs of Leonardo da Vinci to life. One of the world's greatest and inventive minds, the exhibition shows his passion for nature, science and art with life size recreations of his works. AC/DC Family Jewels, held at the Melbourne Art Centre, collects memorabilia from Australia's most iconic band and their record company. Free to the public, it covers the 35-year career of AC/DC, one of the greatest rock bands, with original material revealed publicly for the first time. Reed Gift Fairs, known as the major gift product expo, are one of the most anticipated events on the Gift industry calendar. The fair will be exhibiting gift products including kitchenware, homewares, jewellery, fashion and more at the Melbourne Convention and Exhibition Centre. History Comes Alive at Werribee Park is a special holiday program of free, hands-on tours for children where they can discover what life was like at the Chirnside Mansion and its surrounds in the time of swag-men, sheep drovers and the feared bushranger, Ned Kelly. Bookings are Essential. The Choir, presented by Fly On The Wall Theatre at St Kilda's Brightspace Gallery, tells the story of an orphanage boys' choir, their determination to win a national competition for the fourth year in a row, and the dark secret holding the choir together that gets in the way and tests their loyalties. The Swimming Club, held at Melbourne Theatre Company in Southbank, is a co-production with Black Swan State Theatre Company featuring Tina Bursill and John Waters in the story of six friends who reunite on a Greek island where they'd spent an adventurous summer thirty years earlier. Its All Good Fun Among The Gumtrees, playing in Carlton, is a new double-bill comedy created by upcoming Melbourne writers. Consisting of two comedy plays, the first is a farce about a birthday surprise gone wrong, while the second examines a day in the life of three Koalas. The Drowsy Chaperone, held at the Art Centre's Playhouse Theatre, is a nostalgic look at the golden age of musicals as Geoffrey Rush stars as a die-hard musical theatre fan who invites us into his dreary living room where an outrageously funny musical from the 1920s bursts into life. A Midsummer Night's Dream, held as this summer's production of Shakespeare Under The Stars in the Royal Botanic Gardens, features a young, vibrant and comical cast that brings the playful tale of love, mischief and magic to life, you can bring your own picnic or order a gourmet hamper. Jersey Boys, performed at the Princess Theatre, is the Broadway hit that charts the story of Frankie Valli and The Four Seasons as the play takes a nostalgic look at how four blue-collar kids became one of the great music successes while showcasing the songs they became famous for. Latin American Night, held at Elio's Bar and Restaurant in North Fitzroy, features FUEGO Latin American Band, one of Melbourne's best Latin groups. With delicious food available and great rhythms, the night includes free Cumbia and Salsa lessons from expert instructors. Diego Guerrero Flamenco Latin Quintet, featuring one of Spain's most respected musical innovators, Diego Guerrero, will be appearing at Melbourne's Bennetts Lane Jazz Club where he'll be joined by percussionist Nasrine Rahmani, offering the chance to hear a true flamenco voice. Julie Stewart will be performing at Cristal Lounge in the heart of busy South Yarra. Delivering a truly unforgettable after-dark experience at the stylish cocktail bar, Julie Stewart performs passionate ballads and songs of love, loss, pleasure and pain, with support from H.A.T.S. Peruquois & Praful will be appearing at RMIT's Kaleide Theatre as part of their Breathing Love Tour. With the music of Chantress Peruquois and Wind instrumentalist Praful, the acclaimed world music artists capture the magic of ancient Indian classical with the fresh refinement of jazz. The Michelle Nicole Quintet will be appearing at the Paris Cat, one of Melbourne's Premier Jazz Clubs and voted one of the best World music venues in Australia. Known for her ability to find the heart of a song, Michelle Nicole's ease of improvisation brings to mind greats like Ella Fitzgerald. The Buddy Love Jazz Quartet will be performing at Kojo Brown in Richmond, offering the perfect chance to catch some laidback jazz. The evening will see the Melbourne jazz vocalist, Buddy Love, performing an eclectic blend of soulful tunes and jazz standards with his formidable band. Grand Wazoo, the Legendary Kings of Soul, will be performing at Queen Street's Blue Diamond Club. With four lead singers, six horns and four rhythm players, the band offers vibrant arrangements of Black Soul and R&B Classics, playing greats ranging from the 50's through to the 60's. The Rooftop Cinema flickers into action with film screenings of everything from cult favourites to new releases and documentaries, literally offering the height of entertainment with screenings held on the rooftop of Swanston Street's Curtin House along with the rooftop bar. ET's Comedy Bight is a free weekly comedy room night held at ET's Hotel in Prahran. With free comedy held each Thursday from 8pm, the nights also offer a $15 Steak & Wine (or Pot) Special so you can fill your belly in between belly-laughs with some of Melbourne's best comics. Comedy@Spleen is a comedy night at Spleen Bar in Bourke Street, where you can enjoy a great night out with an eclectic mix of Melbourne's comedy scene featuring established personalities and comedy legends from radio and television with guests such as Glenn Robbins, Corinne Grant and others. Baloomba-wop, held at Altona Meadows Library, is a musical adventure for kids. Performed by Donna and the Aspinauts, the show is an interactive, off the wall, musical adventure for kids and kids at heart, appealing to fans of Dr Seuss, Lewis Carroll and Roald Dahl. The Wind in the Willows, Melbourne's favourite family entertainment, returns with its well-loved tradition of bringing the animals to the Royal Botanic Gardens. Pack a picnic, pack the kids and join Rat, Mole, Badger and Mr Toad, as they bring to life Kenneth Grahame's classic tale. Sand Sculpting Australia will again present a special display as part of the Frankston Waterfront Festival with their newest theme 'Great Moments In History' featuring 3,500 tonnes of sand carved into spectacular sculptures depicting people, places and events that have shaped our world. Learn Circus with NICA - Drop into Fed Square each Monday and try your hand at basic circus skills with experienced NICA trainers. Offering the chance to get a taste of circus in your lunchbreak, these free, fun workshops are suitable for all ages with a range of circus skills on offer. Silvers Grand Magic Circus will be holding performances in Altona. Established in 1976, Silvers Grand Magic Circus offers a great show for people of all ages with performers including everything from jugglers and clowns to acrobats, international performers and more. Circus Sunrise, an action-packed show for all the family, will be appearing with performances held at Epping Plaza Shopping Centre. A true family circus with lineage going back to 1648, the performances of Circus Sunrise feature juggling, acrobatics and whip-cracking excitement! More on Crown Entertainment Complex | Learn More about Melbourne! Fat-Loss-A-Thon is an on-line competition where you can lose weight, win prizes and help raise $250,000 for charity. For only a $10 donation to The Sports Rewards Foundation, entrants can help a good cause while losing weight with a proven 12-week program called The Real Body Plan. The Mornington Collectables & Memorabilia Fair, held at Mornington Racecourse, is a great chance for collectors and enthusiasts of many passions to pick up a bargain and find rare items with traders offering vintage, retro and modern collectables with sports memorabilia, model toys and more. The Suzuki Night Market, held weekly at Queen Victoria Market, has become a summer tradition that offers a great mix of unique products and a great atmosphere with a stunning mix of world food, eclectic wares, bars and even two stages showcasing the best live music! View MARKETS on any day of the week to make the most of the rare sunny days (it's a coin toss, isn't it!) and head to one of Melbourne's many excellent markets, fetes and fairs for a bargain! Republica at the St Kilda Sea Baths Complex has regular drink specials and exquisite dining with great views of Port Phillip Bay. Book Through Menulog and enjoy $5 Pizzas Every Monday from 5pm to 7pm when you dine at Republica! Offer Ends January 28, 2010 | Make a Booking Today! Menulog Gift Vouchers are the perfect way to treat someone special to a great dinner with vouchers available for a wide range of participating restaurants in Melbourne and across Australia. There's even the option to buy a voucher and let the lucky recipient decide which restaurant they'd like to dine at! The Australian Open, held at Melbourne Park, plays host to the hottest event on the Tennis calendar. Running for two, the Australian Open will see the world's finest tennis pros hitting the courts with matches held at Rod Laver Arena, Hisense Arena and the Margaret Court Arena. South Sea Roller Derby hold a Recruitment Day and Learn to skate session each week at Frankston Skateworld, located in Carrum Downs. The sessions are a chance to learn more about the Roller Derby and learn the basic skills required to begin training for one of the hottest sports in town. The world record for the largest human wheelbarrow race was broken in 2008 on September 9th when Melbourne's own Carey Baptist Grammar School in Kew set out to break the previous record that had been held by a high school in Singapore. Aside from breaking the Guinness World record for the largest number of participants with a staggering number of 1,044 people, one pair of students decided to take it further and managed to break a second world record that day, also breaking the record for the fastest time in a 50-metre Human Wheelbarrow Race by making the distance in just 14.87 seconds. 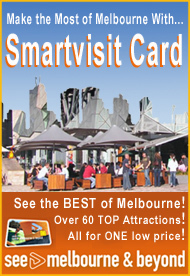 OnlyMelbourne is now mobile phone compatible. Yes, our pages are formatted to be viewed on the small screen. To view our mobile phone website, go directly to our home page with your web compatible mobile phone and you will automatically be redirected to the mobile compatible version of OnlyMelbourne, so you'll be in the know on the go!